Australian-based Sun Resources announced in late May of 2014 that it is buying a 50% non-operated working interest in 10,028 gross (5,014 net) Eagle Ford acres in Bastrop County's Badger Oil Project area. Company officials said the acreage was acquired from the project's operator, Houston-based Ursa New Ventures LLC, who will retain a 50% working interest in the acreage. The companies did not disclose the purchase price, but Sun said in a company statement that it will use existing cash to fund the transaction. This acquisition comes on the heels of another Australian-based company, Sundance Energy, announcing this week a $33-million deal to acquire 11,000 net Eagle Ford acres in Dimmit and Maverick counties. That deal increased Sundance's acreage position in the play to 19,500 net Eagle Ford acres covering 295 gross (196 net) drilling locations. The Badger Oil Project area is located offset to the Giddings oil field, a prolific Austin Chalk oil field, that has produced over 1-billion bbls of oil. Sun and Ursa are planning to spud the first horizontal test well before the end of November 2014, prospective for the Eagle Ford and the Austin Chalk formations, to determine the commercial oil potential. 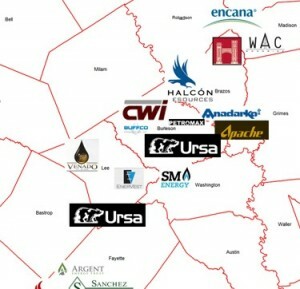 The first well in the Badger Oil Project is projected to be a 5,500 foot lateral drilled within the Eagle Ford section.